As the founder and an advocate for Scholar Career Coaching, Lynne Wideline Gassant was set on a path to help students and young leaders achieve their academic and career success. She, too, had lived the experiences of being a non-native speaker and later, a first-generation college student. And Lynne tenderly remembers the challenges to learn the American educational system on her own. At age 14, Lynne arrived to the United States as the oldest child of Haitian immigrant parents. After her family settled in public housing in Delray Beach, she had to learn the American education system, while also learning English and a new country. Those teenage years were filled with angst and discovery of so many new expectations, coupled with a strict Haitian upbringing. But, she soon found her niche and a supportive educator/mentor, who helped her learn how to excel during her high school years. It was the culmination of those experiences that planted the first building blocks for Scholar Career Coaching. As an inquisitive teenager, Lynne navigated the rigors of this new educational system in Palm Beach County schools and she often struggled with English-language learning because Haitian Creole was her first language. It is these early experiences with American schools that helped her understand the many roadblocks for non-native speakers. It was like a “light went off” and she could clearly see that there was a light at the end of the tunnel… with the right support. Hillary Rodham Clinton wrote a book in 1996, “It takes a Village to Raise a Child,” that’s based on an African Proverb. The proverb conveys the sentiment that we—our society and communities—have a responsibility to provide guidance, instruction, and vision to our youth. Therefore, while still in her 20s, Lynne founded Scholar Career Coaching (Scholar CC) in 2012 so that other students, much like her, could excel in their academics too—with the right support, success strategies, and mentorship. So, this all began from scratch, with a vision and a dream. As Scholar CC’s executive director, she still manages to live a full, well-rounded life as a human resources manager, wife, mother, and big sister. In her spare time, she enjoys Chinese and South Korean dramas and loves dancing. Gassant holds a bachelor’s degree in public management from FAU and a master’s degree in human resources management from FIU. 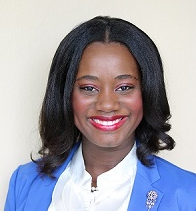 She’s a member of Sigma Gamma Rho Sorority and is currently an advisory board member for the City of Boynton Beach Education & Youth. And, she also competed as Mrs. Palm Beach County in the 2017 Mrs. Florida United States Pageant. This spring 2019, Gassant is selected to be honored in Legacy Magazine’s “50 Most Powerful Black Leaders in Business and Industry” issue for South Florida. In Spring 2018, she was recognized as by her alma mater, Palm Beach State College, as the Alumni recipient for the Dr. Martin Luther King, Jr. Leadership award. In April 2018, her volunteer work was recognized by the Department of Education in Washington, DC. In Spring 2018, Scholar CC became a United Way of Palm Beach County mentoring program. In August 2017, Gassant’s work with Scholar Career Coaching was rewarded with the Volunteer Florida Champion of Service Award. The award was presented by the Florida Cabinet in Tallahassee.